A relatively new force within the Australian scene, Suldusk is the vision of Emily Highfield. With a sound that pulls in several different directions, but with a uniform tone of gloominess and atmosphere, the debut album Lunar Falls is an exciting beginning. 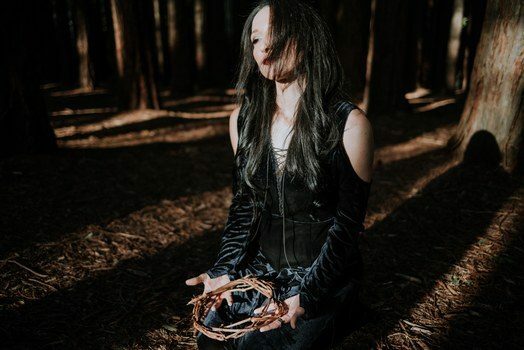 There’s plenty to draw in the post-black, post-rock crowd with the appeal to nature, but the gothic/doom piece gives it an effectively harrowing bit of darkness to truly polish things up. We felt it necessary to fire off some questions to engage Highfield, who fills us in about the influence of the band Trees of Eternity, emotions present within the album, and what lies ahead for the band. Dead Rhetoric: How do you describe the sound of Suldusk to the average person? 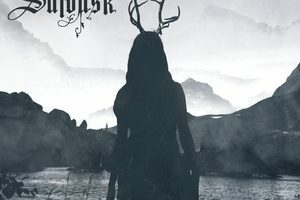 Emily Highfield: Suldusk could be described as acoustic neo folk infused with heavier atmospheres of atmospheric black metal, post rock and doom. The sound also features vocals, both intimate/clean and epic harsh. Dead Rhetoric: What are the emotions that you are trying to stir up along the way on Lunar Falls? Highfield: There are many emotions, but this style is steeped in melancholy. There are moments of lightness and indignation as well. There is an intimacy in the sound as well. Dead Rhetoric: What was the writing process like for Lunar Falls? Highfield: The songs all came together quite quickly after I decided to record a studio album. The challenge was to record the different elements, as I had envisioned them and maintain the original feeling. Dead Rhetoric: Did you find any particular challenges in recording the album? Anything you’d like to try differently in the future? Highfield: Yes, definitely. There are sections that in retrospect I would have extended, but once tracking was done, it was hard to go back and make major amendments. I think ideally, going forward, it would be great to play some new songs live and let them brew a little before recording them. Dead Rhetoric: Where did the idea come from to adapt the song “Sinking Ships” instead of merely covering it? Highfield: It felt right to continue the story of the song. The theme of The Elm is of bittersweet memories and longing. You are lucky to have the beautiful memory, but it also hurts to remember. When I think of Aleah, I feel grateful for her contribution to the genre, but also profoundly sad that she is not around to continue her work. It was my expression of that feeling. Dead Rhetoric: How much of an influence did Trees of Eternity have on Suldusk? Highfield: Aleah’s vocal execution reinforced to me the beauty and power in a close mic technique, especially in the context of heavier music. A singer called Ines Bonet from Spain’s Black Mirror also reminded me of this. As has William Fitzsimmons. I had always loved experimenting with a more intimate vocal sound, so these artists all reminded me how powerful that style is. Dead Rhetoric: There’s an emphasis on acoustic guitar, what do you like about using it in the reference of something that is influenced by black and doom metal? Highfield: There is something so natural and real with acoustic. I have been following Xasthur’s latest incarnation as a doomgrass ensemble and love how he brings a dissonance. It’s about creating atmospheres without pedals and effects. Just the visceral sound of strings, slides, resonance and feeling. Of course, Agalloch have been a huge influence in this respect as well, as so many of their compositions are stemmed in acoustic. Dead Rhetoric: What role does nature play in the music? Highfield: Nature is referenced throughout the album. All tensions and melancholy are diffused in the context of something timeless and bigger. Tears and the illusion of control are pointless when you stumble across the functioning natural world in all its brutal glory. It continues and flows with a force. Also, there is a respite and replenishment that forest bathing and playing in the ocean provides. Dead Rhetoric: How did you get hooked up with Northern Silence Productions? Highfield: I was always a fan of this one man label and the artist roster he has curated over the last 15 plus years. Torsten also has an affinity with one person projects and vice versa. There is an understanding between lone wolves! When we chatted there was mutual respect and admiration and I am grateful to be amongst artist like Unreqvited, and Heretoir and also where Saor and Ghost Bath got started. Dead Rhetoric: What do you hope the listener gets out of Lunar Falls? Highfield: I think Lunar Falls can be quite immersive for listeners who are into this more atmospheric style. It can be melancholic and also quite soothing. A place for retreat where there is dark but also light shimmers. I definitely find this is the general consensus from the audience that has connected. Dead Rhetoric: What would you like to see Suldusk accomplish in the future? Highfield: There are definitely more albums to complete. The fusion of neofolk with post metal and black metal is a very exciting space! Dead Rhetoric: What plans do you have once Lunar Falls is released? Highfield: I am currently working on bringing a bigger live sound. The shows have up until now been acoustic but having a full drum kit and three guitars will make it a lot more immersive. Later in the year, a tour, and next year overseas. I have some wonderful musicians around me. I guess you could say a wolf pack has taken shape!